What is the Adoption Authority of Ireland? The Adoption Authority of Ireland is responsible for deciding on all adoptions in Ireland and for making adoption orders. What is an adoption order hearing? An adoption order hearing is a legal ceremony. It is when an adoption order is made, and you become a legal member of your family. Do I have to attend the hearing? Yes. The hearing is about you so you need to be there. Where does the hearing take place? The hearings usually take place at the Adoption Authority’s offices in Dublin. Sometimes, the hearings take place in local hotels or offices in different parts of the country. How long does the hearing take? Adoption order hearings take about 10 minutes. Who else goes to my adoption order hearing? Your parent/parents must go. Any other members of your family that you would like to be there for your adoption order hearing can also come along. Do I need to do anything to get ready for the hearing? Do I need to wear anything in particular to the hearing? You can wear whatever you like. If I am more comfortable using a different language to English, will the Adoption Authority get a translator for me? If you would like a translator, then please let us know. If I have a disability, will the Adoption Authority help with any needs I have when I go to the adoption order hearing? Yes. If you have any particular needs, please let us know and we will do what we can to help you. What happens when we arrive at the Adoption Authority? 1. You come in and sit in our waiting area with your family. 2. An Adoption Authority Board member will come and say hello to you all. 3. They will bring you and your family to one of our family rooms. 4. They will explain what will happen in the adoption order hearing. 5. They will make sure they have the correct information about you and your family. 6. They will ask you what you think about being adopted. 7. They will ask you if you have any questions and try to answer your questions. 8. They will bring you into the room where the hearing takes place. Who will be in the room when the hearing itself is happening? - About 8 people from the Adoption Authority, members of the board and staff. What are the people at an adoption order hearing there to do? The people at the adoption order hearing have a few different jobs. They are there to make the adoption order, to witness the adoption order being made, and to help with the adoption order hearing. What do these people know about me, and what I think about being adopted? The members of the Board have seen a report from the social worker who worked with your family. This report includes what you said about being adopted. What happens during the adoption order hearing? 1. You and your parent/parents will sit at the table. Any other family members with you will sit behind you. 2. The Chair of the Board is the person in charge of the adoption order hearing. He will welcome you all and explain what will happen. 3. The secretary of the board will ask your parents to stand up, and swear that they will tell the truth during the hearing. 4. The secretary will ask your parents some questions about who they are. 5. The Chair will ask if you are happy for the adoption order to be made. 6. The secretary will ask you and your parents to sign documents. 7. The Chair of the Board will ask your parent/parents if they understand what it means to adopt you. 8. The Adoption Order is made. 9. We will take a photo of you, and your family. 10. The secretary will give your parent/parents information about how to get a new birth certificate for you. 11. 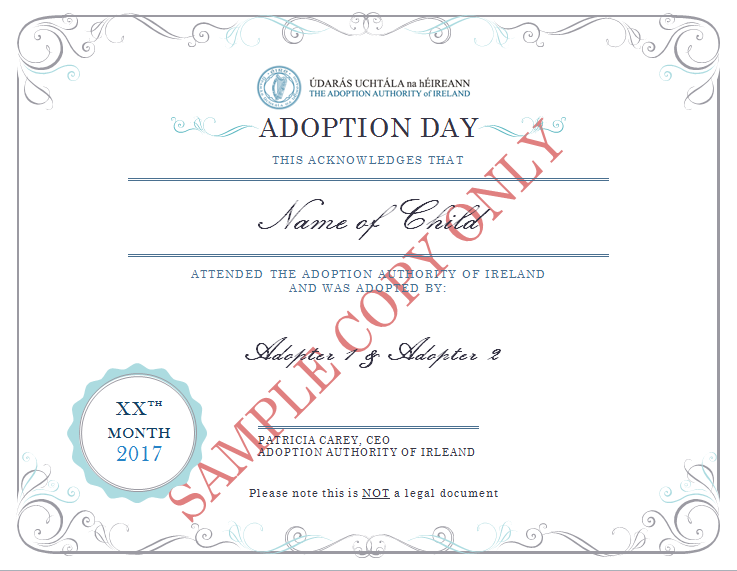 You will be given a certificate as a memento of your adoption order hearing. Can I ask questions during the adoption order hearing if I am not sure about something? Yes. If you have any questions, please ask one of the people from the Adoption Authority. Is the adoption order hearing the end of the adoption process? Yes. When the adoption order is made, you are legally adopted and the process is over. Can we take photos during the hearing? You and your family can take photos after the adoption order is made. Staff at the Adoption Authority will be happy to take some photos for you. Who can I contact at the Adoption Authority if I have any other questions about the hearing?